A 17-year-old boy from a rural town in Mexico came to the hospital with complaints of severe eye pain and decreased visual acuity in his right eye for about three weeks. When doctors examined him they found that he could see only hand motions.His Intraocular pressure in the right eye was elevated at 30 mm Hg (reference range, 10 to 21 mm Hg). Slit-lamp examination of the right eye revealed corneal edema, blood in the anterior chamber, multiple iris perforations, and an inflammatory pupillary membrane with zones of retinal ischemia on the posterior segment.They were nervously surprised to find a flattened and mobile trematode was seen moving freely in the anterior chamber (arrow; see also Video), migrating through the iris perforations from the anterior chamber to the posterior chamber of the eye. The patient reported no relevant food exposures, history of swimming in lakes, or other water exposure. The serum eosinophil count was normal. An analysis of a stool sample revealed no ova or parasites. The patient received oral treatment with praziquantel and underwent lensectomy and vitrectomy to surgically remove the trematode; extensive damage to the retina and iris was found during the procedure. The trematode was removed in multiple pieces and could not be more specifically identified. 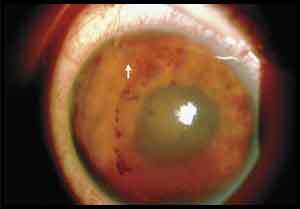 After 6 months of follow-up, the patient had no improvement in visual acuity in the right eye. Trematodes or Flukes are ubiquitous parasites in vertebrates and in humans their infection is internal and they are found in liver, lungs, the intestines or perhaps blood but not in the eyes. “It is not common for trematodes to infect eyes; it is not common for any kind of worm to infect eyes,” ophthalmologist Pablo Guzman-Salas, who treated the patient at the Institute of Ophthalmology in Mexico City, told LiveScience. Patients get a parasitic fluke infection in various ways, depending on the life cycle of the particular flatworm and most common causes are swimming in worm-egg tainted waters or ingesting the parasite through food. But it’s mysterious as to how this particular teen got his extremely rare infection as he reported no relevant food exposures, history of swimming in lakes, or other water exposure. His investigations including serum eosinophil count was normal. An analysis of a stool sample revealed no ova or parasites. The patient was given oral treatment with praziquantel.He was subjected to lensectomy and vitrectomy to surgically remove the trematode; extensive damage to the retina and iris was found during the procedure. The trematode was removed in multiple pieces and could not be more specifically identified. After 6 months of follow-up, the patient had no improvement in visual acuity in the right eye. The case report was published in The New England Journal of Medicine.